After my graduation in Vilna, I returned to Vishnive. I did not live in my brother's home anymore. I lived at my Mother's home where a space was arranged for my sewing shop. As soon as my sewing machine was installed, I got plenty of work. There was a lot of competition because there were other tailors in town, including the one I had my apprenticeship with. She began badmouthing me. I avoided any comment and let my good work speak for itself. Initially I charged low prices for my work which would not even be sufficient to cover my food expenses. Later after I became well known my situation drastically improved. I earned much better. I got several apprentices of my own. An additional room was built and added to my shop. I was quite satisfied. I had Jewish clients from Vishnive and Gentile clients from the surrounding villages. Women from Vilna constituted a special type of clientele. Their husbands were businessmen in the timber industry. They were selling, buying and warehousing timber from the huge forests in the region. These women used to come to Vishnive, rent a room or stay in a hotel. They would prepare their "Garderova" (wardrobe) of clothing for an entire season. It was worthwhile for them to do this in the shtetl as the quality of sewing was very good and the price was lower than in Vilna. I liked this clientele because they brought the big city atmosphere with them. They followed the latest fashions which made work more interesting. I should mention a memorable incident I had with a Gentile client. She was enthusiastic about a certain dress she saw in one of my professional journals. I prepared the dress for her, and she was very satisfied and took it home happily. The next day she returned crying. "What happened?" I asked. She answered, "My husband does not want to see me wearing this dress. He says that I look like an intelligent Jewish teacher." The Gentiles in our area wore only one style of dress. The dress would reach down to the heels. The bodice was fitted and the skirt was loose. There were short sleeves for summer, and long sleeves for winter. I had to undo my work and redo it for her. Although I was successful in my work, I continued to dream about "Aliyah" to Eretz Israel. My brother, Yaacov-Hirsh, continued to encourage me to look for the first opportunity to leave. He had the same dream for his own family. He believed that the only place for Jewish people was there. Even today it pains me to think that he, the Zionist educator of generations of students, who established the "Tarbut" school, was prevented from fulfilling his dream. My sewing business grew bigger and consumed most of my time. However I was very active in the "Hechalutz" movement. Chaim Abramson established the local branch as a continuation of the Zionist education in the "Tarbut" school. As in Vilna, I made a concentrated effort to contribute my spare time to this organization. Our meetings were conducted at the home of Isar Brekman, who volunteered the space. I was one of the editors of "Bama'aleh", a bulletin of "Hechalutz". Guides and "Shaliachs" were sent from the Vilna Center to prepare us for "Aliyah". We got lectures about the labor movement in Eretz Israel and about becoming "Chalutzim" (pioneers). In addition, our beloved teachers conducted classes for young adults about literature, history and "Tanach" (bible). 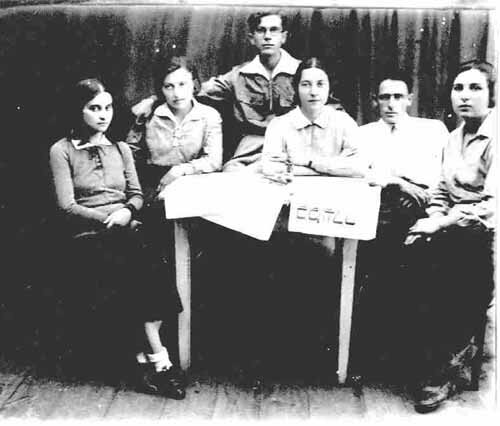 A Vishnivean group of "Hechalutz" was already in Palestine since 1926. They formed the nucleus of kibbutz "Hakovesh"* that was initially camped near the town of Petach Tikva. Among them there were: Gershon Rogovin (my husband Mordechai's brother), Hannah Meltzer, Aharon Dudman, Ben-Zion Dikenshtein, Sara Dudman, Esther Heyman, Pesach Magid, Sara Yoches, Moshe Rabinovich, Fredka Gitlitz and Rivka Kalman. * Later, after getting land, this group actually settled and established the kibbutz, Ramat Hakovesh, north of Kfar Saba. My "Chevreh" in Vishnive dreamt about leaving the "Life of the Miserable Exile" and making "Aliyah". Some would go on "Hachshara" where they would be trained for productive life in a kibbutz (commune). "Hachsharot" were conducted by "Hechalutz" and by "Hashomer Hatzair" movements. 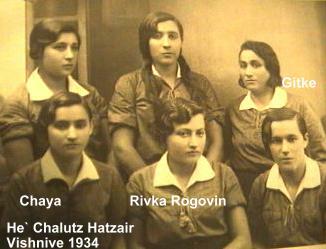 In 1936, my good friend Rivka Rogovin Bekman (my husband's sister) made "Aliyah" as a student to "Meshek Hapo'alot" Agricultural School in Hadera. She was the exception to the rule. The gates to Palestine, at that time, were almost totally closed by the British to Jewish immigration. So although there was quite a large Zionist group in Vishnive who were ready for "Aliyah", they had no choice but to stay put. Their disappointment and disillusionment led to a decline in the Zionist movements' activities in 1935-1936. Chaya and her frinds from "Hechalutz"
The numerous Jewish political parties in Vishnive should be acknowledged: "Hechalutz", "Hashomer Hatzair", "Algimeine Zionists" (Religious Zionists such as Hapoel Hamizrahi), "Agudath Israel" (Ultra Orthodox), and "Beitar" (Jabotinski).